This handsome cooperative apartment house is known for its penthouse that was owned for many years by Condé Nast, the publisher, and its amusing decorative frieze above the third floor of tortoises and hares, shown below. The penthouse was not the first in the city. Top floors were often allocated previously for servants' quarters, and sometimes for laundry equipment. 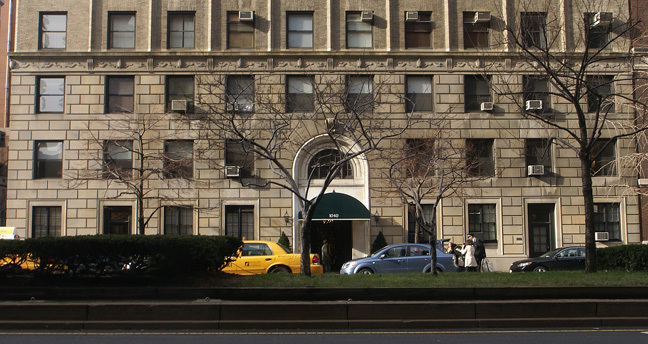 "Although steam dryers had been introduced early in the century, many people preferred to dry their wash in the sun; tenants in some buildings were allotted specific days of the week when they could have their maids use the rooftop laundry (if it rained, tough luck)," observed James Trager in his book, "Park Avenue, Street of Dreams," Atheneum, 1990. The penthouse in this building, however, was the first to be widely popularized. "It was certainly the most famous in its day, and remains a benchmark for architectural historians," noted Christopher Gray in a November 7, 1993, article on a cleaning of the building's façade in The New York Times. "Nast inaugurated his apartment, decorated by Elsie de Wolfe, with a housewarming dance on Jan. 18, 1925. His wide-ranging guest list included George Gershwin, Edna St. Vincent Millay, Rube Goldberg, Katherine Cornell, Jascha Heifetz, Fannie Hurst, Fred Astaire, Edward Steichen and John Drew," Mr. Gray recounted. The next year, he continued, Nast hired the building's architects, Delano & Aldrich "to design a greenhouse-like glass canopy to cover the terrace and had the ballroom extended to the edge of the building." The building's three-story limestone base is topped by the tortoise-and-hare frieze that has been adopted by the American Association for the Advancement and Appreciation of Animals in Art & Architecture, founded by Parks Commissioner Henry Stern, as its logo. 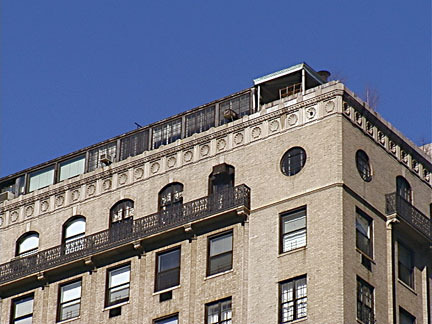 Just beneath the penthouse is a floor with rounded windows at its ends and arched windows facing on a common and very elegant wrought-iron balcony. The beige-brick building, which has no garage, was designed in a neo-Georgian style with some hints of Art Deco, and is highlighted by subtly projecting piers. It was developed by Joseph L. M. Mayer. There is excellent cross-town bus service on 86th Street where there is also an express subway station at Lexington Avenue. Local shopping is excellent and this Carnegie Hill neighborhood is rich in schools and religious and cultural institutions.